Everyone knows Vancouver is a great city for vegan eating, but what about when you go further afield? Fear not, there are plenty of options for those looking to eat plant-based in the suburbs. Whether you want vegan pizza, hot dogs, smoothies or Taiwanese cuisine, these are the best vegan-friendly restaurants to try in Metro Vancouver. Surrey isn’t necessarily the easiest place to find vegan food, but GNJ Vegetarian Bistro offers a separate vegan menu, and food is thoughtfully prepared here to be fresh and to appeal to a variety of tastes. Particularly good are GNJ’s burgers and onion rings. Also, their chai lattes are incredible. This much-loved Vancouver take-out staple has been around since 2011 on Kingsway, but more recently a Surrey branch opened, delighting customers in the Greater Vancouver Regional District. As well as their huge array of crave-worthy vegan pizzas, Vegan Pizza House offers such delights as donairs, lasagne, and spanakopita, all for reasonable prices. Newly-opened in August 2018, this beautiful plant-based luncheonette prides itself on offering whole food, seasonally changing dishes that are both nutrient-dense and protein-heavy. It’s unusual to find somewhere offering this kind of fare outside Vancouver, and their Macro Bowls (particularly the Mezze) and smoothies will have you coming back for more. 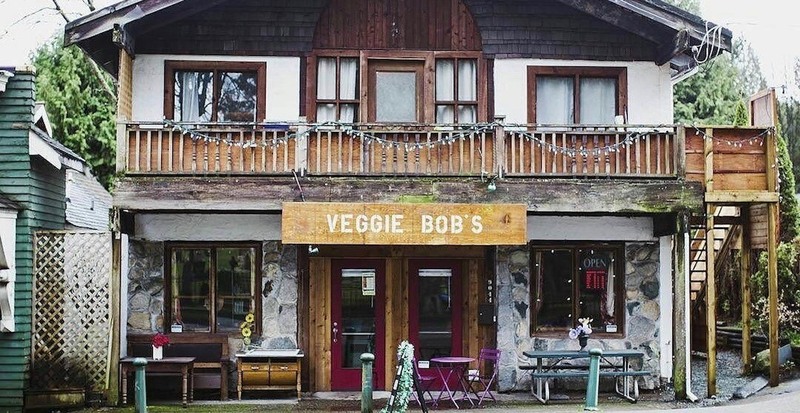 A bit of an institution in Fort Langley, Veggie Bob’s has been around since 1978, starting life as a grocery store and moving towards a fully plant-based restaurant more recently. Serving vegan comfort food, you’ll find staples like mac and cheese, burritos, veggie dogs, and apple pie on the menu. Portions are large and the interior is quirky and cozy – once you settle in you won’t want to leave. Another Vancouver staple that’s recently opened branches further afield, The Juice Truck is, unsurprisingly, the go-to vegan place to quench your thirst in Steveston. As well as the ever-popular Green Protein and Coffee Date smoothies, they also offer a menu of nourishing food options such as the Macro Bowl and the Jackfruit Taco Bowl. Go for the juice, stay for the food. One of the few vegan-friendly spots to try in Richmond, 4 Stones is a popular small vegetarian Chinese restaurant offering many vegan-labelled dishes. Their prices are fair, the service quick, and the food tasty (although be warned, you may have to wait for a table). Try the Vegan Gyoza, and the Sweet & Sour Treasure. If you’re looking for food that’s fresh and nourishing, Nulife is the place for you. Almost fully vegan except for honey, the raw menu offers pasta, wraps, and sandwiches that will fill you up without leaving you bloated. Also worth trying are the sweet offerings, particularly the crepes and the excellently-titled Breakfast Pizza (a buckwheat crust topped with seasonal fruit and cashew cream).